Starting off, just let me say that the author has a cool name. Walker Percy. Walker. Walker Texas Ranger. George Walker Bush. Walker. I like it. So, I’m finished with Lancelot. I didn’t FINISH it but I’m finished WITH it. I was really looking forward to reading this book. I spent the whole $9.99 to download it to my Kindle. According to LOST lore, this book is considered to be one of the most influential books for Sawyer, the Island’s redneck bookworm. 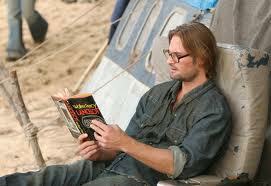 This is an accepted fact among fans because even though Sawyer was seen reading many books in his down time on the island, Lancelot was one of the three “Collector” type editions that was stacked on his dresser in the season six episode “Re-Con.” This episode centered around Sawyer’s flash sideways life. (You get that if you watched season six.) The other books in the stack were Watership Down, (love it), and A Wrinkle in Time, (love it). In those two books I can see a connection to the character of Sawyer. In Lancelot, not so much. This is not the Arthurian Lancelot; though there are references to Sir Lancelot, Merlin and Guinevere. This Lancelot is a patient in a psych ward and he has been there for a year. His childhood friend, Percival, is a priest and he makes regular visits. Percival listens as Lancelot tells the story of how he murdered his wife after accidentally discovering that she had deceived him. Add to that the discovery that his 10 year old daughter wasn’t biologically his and you’ve got a very unhappy Lancelot. Now, given the circumstances, I expected course language and some sexual content. And although it bothers me, I can take a moderate amount if I really care about the story. In this case, I got a-plenty. The musings and memories and the general mind wonderings of this man were more than this girl cared to know. And that’s all I’m going to say about that. As I was reading I was trying to figure out if Lancelot was insane or if he was in control of all his faculties then, and on the night of the murder. As he told his story, which took the whole book to tell, I believed he was mentally healthy. (And when I say this man took the whole book to tell that story I mean to say that he can catch a verbal tangent like a girl! Good grief we chased about thirty rabbits!) So, I’m thinking he is quite sane because of how he unfolds his story and also because, (and this really impressed me), when he found out about his wife’s deceit, he IMMEDIATELY stopped his excessive drinking all together, kicked other bad habits, focused, cleaned up and began to plot his revenge. I’m thinking most people in his predicament do the opposite. Maybe hit the bottle or some other substance and THEN plot their revenge. But I don’t know much about the mind of a murderer. I don’t watch Criminal Minds, ya’ll. It’s disturbing. As soon as I’m convinced the man is sane, (which isn’t really anything that is explored in the book), he begins to rant about how when he gets out of prison he is going to start the Third Revolution. The first being The American Revolution, the second being the results of the Civil War and the third being initiated by him. He’s taking a stand against the ways of the world. He’s not having things the way they are. He and his people will not have it and they will, I don’t know, annihilate everyone else, (I wasn’t clear on that), and begin a new world. It’s all an interesting enough story….but this is why I’m finished with the book…. Throughout the story Lancelot ponders a lot of life questions. A Psychology major or Philosophy major would probably love this book. He questions sin, the existence of evil, and makes several comments about how God got this wrong, or didn’t do this right, yada, yada, yada. I can chalk some of that up to ignorance or a general attitude against religion or whatever. This was a man who was deeply wounded and angry and that’s a direction many people take when their lives barrel out of control. But when I got to about 80% in the book, (my kindle tells me what percentage I am in the book, not the actual page number), he just took his ranting too far. Although I’m not certain what blasphemy truly is except what Scripture says is the ONE unforgivable sin, this just had to be close. In fact, if I were Walker Percy, I would be afraid that I ever wrote those words. I know, it’s for a fictional character, a mentally unstable character, but still, I felt like someone took a gardening spade and dug out chunks of my heart and just threw them out in the yard. So, I didn’t see how things went down the night of the hurricane. I’ll have to live without that knowledge. I don’t know how his wife died or what else happened in the end. And it doesn’t help matters that I read once that this book has like the best quote or something at the end. I’ll admit that I am curious about what it says. Maybe I’ll meet someone one day who has read the book and they can give me the low-down. Or maybe I can check Spark Notes and see if they have a summary on it. Until then, I guess if I need to read a really great quote at the end of a book I can always read Charlotte’s Web. So, have any of you readers out there ever read Lancelot? Anyone got an answer for me on the end? Or does anyone out there know any Walkers you’d like to tell me about? Let me know in the comments.